Condition : Visually excellent, not currently working but power supply hums, so could be a simple fix. The early 1980′s saw the rapid introduction of digital drum machines from Linn and Oberheim. These new machines offered unparalleled programming and real samples rather than analog approximations. But they were expensive. E-mu Systems, fresh from developing the Emulator I, saw an opening in the market and introduced a basic sample-based drum machine but at a magic, under $1000 price. It worked, it sounded good, and it sold by the bucket load (at least 7000 units). This was a major success, and when coupled with the EII, it transformed E-mu Systems from a small to medium scale manufacturer. 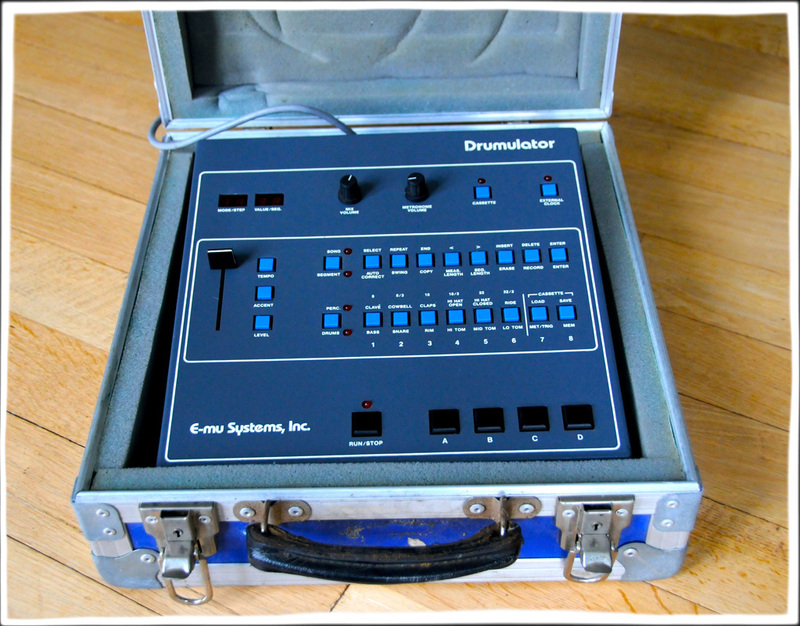 The Drumulator was born in early 1983. 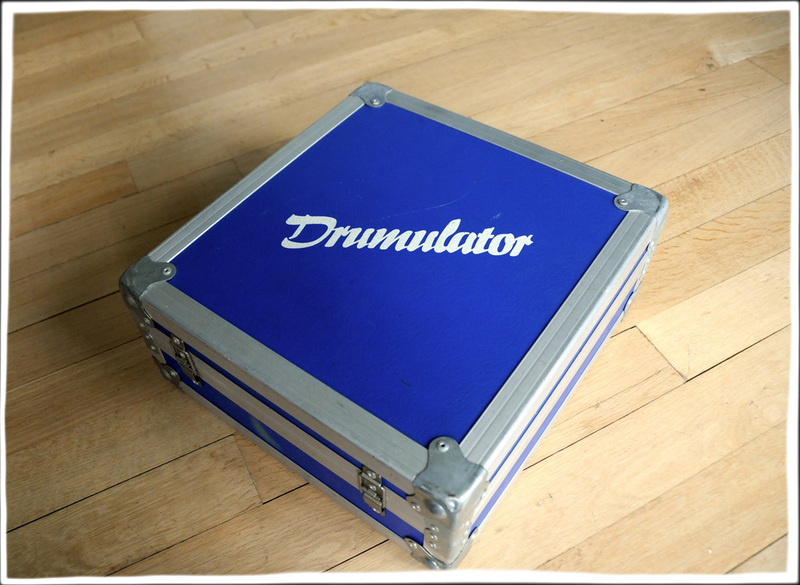 The Drumulator has 12 sounds; bass, snare, toms hi, toms mid, toms low, clave, cowbell, hand claps, hi-hat open, hi-hat closed and cymbal (ride). These sounds play through 8 voice channels. Two of the channels are unfiltered (hi-hats, cymbal), four channels go through selective filters which pick out the right frequencies, and the remaining two (the toms) use dynamic VCF’s. The development team knew how to build good sample replay electronics, but to keep the costs down they had to keep the sample memory down to just 64k bytes. That means 8-bit samples and very short sample times, for the 12 drum sounds. The team also decided on only 4 drum front panel buttons, rather than 12. 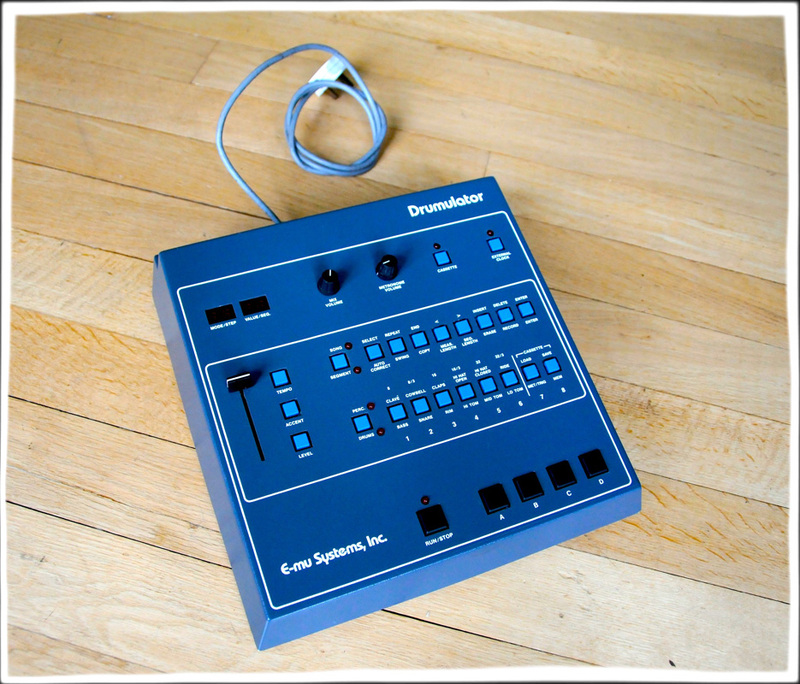 The Drumulator has good programmability in real-time , but no step time capability. There is auto-correct, swing, independent volume and accent control, as well as looping within a song. As with many early drum machines there is only one DAC, which is multiplexed across all the voices. Emulator E-mu Systems could even tell you how to use an Emulator and a computer to create your own custom Drumulator sound chips.